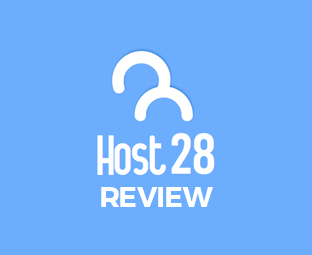 Host28 Review: Why it is a Reliable Hosting for your Website? Host28 is a Linux web hosting company, offering 3 shared Linux web hosting packages since it was established in 2001. Up to now, this web host is powering more than 100,000 websites around the world. It is also highly recommended by lots of it customers. However, is it reliable enough for hosting a blog? The answer can be found in this review we developed according to our real hosting experience and hundreds of Host28 customers' real voice. We also made the following list to help people have a brief understanding about this company before going to the details. Host28 released 3 shared Linux web hosting packages for bloggers which are named after Basic, Advance and Business. These 3 plans respectively start at $5.99/mo, $7.99/mo and $15.99/mo. Now, this web host is offering discounts, with which the prices are cut down to $1.99/mo, $3.99/mo and $9.99/mo. No matter which plan people choose at Host28, they are allowed to pay for their service via PayPal and provided with 30 days money back guarantee. 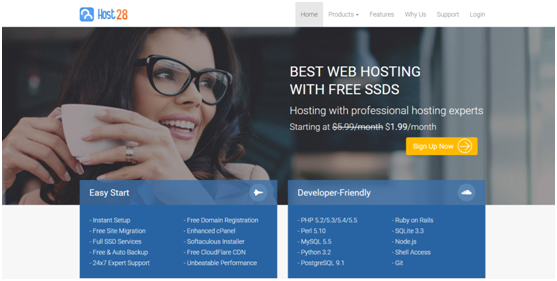 Each Host28 web hosting solution is developer-friendly, supporting PHP 5.5, Perl 5.10, MySQL 5.5, Python 3.2, PostgreSQL 9.1, Ruby on Rails, SQLite 3.3 and Shell Access. Therefore, all of them are 100 compatible with almost popular PHP-based blogging software, and bloggers will not meet any compatible issue when using them. In addition, each package is integrated with an enhanced cPanel control panel that comes with many useful tools to help webmasters manage every aspect of their sites and accounts effortlessly. Besides, a Softaculous 1-click script installer is included in cPanel, with which bloggers are able to install any of famous blogging software with just a few clicks. what's more, all the 3 Host28 hosting packages come with unlimited monthly data transfer, CloudFlare CDN service, free & auto backup, and free instant setup. Furthermore, Business plan includes a free domain name for life, a dedicated IP and free domain name privacy service. Host28 utilizes a state-of-the-art data center located on Chicago, Illinois, which is equipped with a great number of quality Dell servers, fully redundant power supply, UPS, diesel generators, BGP4 connection and many other cutting-edge technologies. Moreover, each server comes with the latest 15K RPM SCSI drives in RAID, SSD, the latest Intel Xeon processors, and more than 32GB RAM. In addition, the data center is highly secured. Stationary officers need to use key card when they access the data center. Also, it is secured with anti-tailgating protocols, stationary cameras and man-traps. Experts are also monitoring the entire network 24x7, so they can deal with any sudden issue immediately. According to our real hosting experience and monitoring results, this company offers solid 99.9% uptime and fast speed. In addition, from the customer reviews we read on the web, almost Host28 clients are happy with their site performance. Host28 support team members are standing by 24 hours a day and 7 days a week to offer assistance. People who have issue with their blogs hosted with this company can contact the support team via email, ticket and live chat. These experts are well-trained and professional, so they will send an efficient solution to customers as soon as they receive a message. In addition, experts in this company have published many guides in the knowledgebase to teach people how to create, manage, secure, speed up and optimize a blog. Besides, they also have worked out many detailed guides to teach people how to use cPanel. According to the aspects we reviewed above, we can learn that Host28 shared Linux web hosting packages are cheap, easy-to-use, secure, reliable and fast. In addition, each plan comes with rich features and user-friendly tools. Besides, this company offers responsive support to help people deal with issues efficiently. Therefore, it is good enough for bloggers who are looking for a reliable and affordable plan for their blogs. Sir,I Have A Problem That Few Months Back I Have Approved Adsense Account From YouTube and From Blogger When I Sign Up From EARNING Tab and Placed Ads Using Adsense Widgets Then It Shows Blank Area.No Ads Were Shown There in Blog. Can U Please Help Me . Are you sure your Adsense account is approved to display ads on website? You mentioned you got approval from YouTube?